Iodized Salt, Flavour Enhancer (Msg), Palm Fat, Sugar, Flavours, Pork (Fat And Meat), Hydrolyzed Vegetable Protein, Spices, Garlic Fat, Egg Powder, Corn-starch. Delivers real pork flavour as it is made of pork meat and fat. 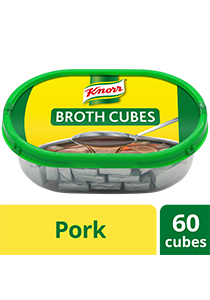 For broth, dissolve 1 cube in 1 litre of boiling water. For more concentrated broth, dissolve 2 cubes in 1 litre of boiling water. Made with real pork. No Preservatives Added.